The favorites continued to cruise on Day 3 at the 2017 FIBA Asia Cup. 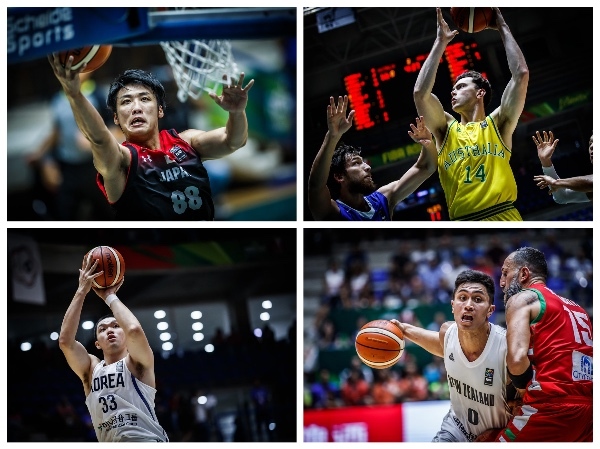 Japan and Korea notched bounce back wins, while the Boomers and Kiwis kept on rolling. Check out all the recaps and highlights from FIBA.com below. apan picked up their first win in Group A in the opening contest of Thursday, with a comfortable 87-49 victory over Chinese Taipei. Despite trailing early, Japan secure the lead with a few minutes left in the first period and would not relinquish it the rest of the way. A dominant 18-5 second period saw Japan get a stranglehold on the contest to run out 38-point winners. Makoto Hiejima and Furukawa top scored for Japan with 15 points each, whilst Chu was the only player in double figures for Chinese Taipei, also with 15. Japan improved to 1-1, whilst Chinese Taipei dropped to the same record. Australia continued their dominant start in their first ever FIBA Asia Cup, defeating Hong Kong 99-58. Australia led from start to finish in the impressive display, sharing the ball and seeing six players reach double figures. Todd Blanchfield led the Boomers with 18 points, as Mitch Creek added 11. Yi Ting Lo led three players in double figures for Hong Kong with 11 points, along with 5 assists. Australia are now 2-0 atop of Group D, whilst Hong Kong continue to look for their first victory at 0-2. Korea recorded the largest victory so far at the 2017 FIBA Asia Cup, finishing up with a 116-55 win over Kazakhstan for a 61-point margin. And despite a slow start, Korea found their rhythm in the second period and cruised the rest of the way. The Koreans shared the ball magnificently throughout, registering 38 assists, including a clinical 14 from guard Chan Hee Park. Junghyun Lee had 19 points, 4 rebounds and 5 assists to lead the victors, who had seven players reach double figures. Mikhail Yevstigneyev was the only player to reach double digits for Kazakhstan, finishing with 19. New Zealand made a statement with a 86-82 win over hosts Lebanon, in what was one of the games of the tournament so far. Fadi El Khatib's near triple double would not be enough for Lebanon; he was unstoppable with 33 points, 11 rebounds and 8 assists, as very little would separate the two sides throughout the majority of contest. Illi led New Zealand's charge with 22 points, whilst Te Rangi and Smith-Milner added 15 each for the young Tall Blacks squad. New Zealand improve to 2-0 in Group C, with the home side falling to 1-1.